You might not think of one of Andalucía’s famous white villages as being “FUNKY”, and neither did I, until yesterday morning when I went into Plaza de la Constitución in Torrox pueblo on an errand. 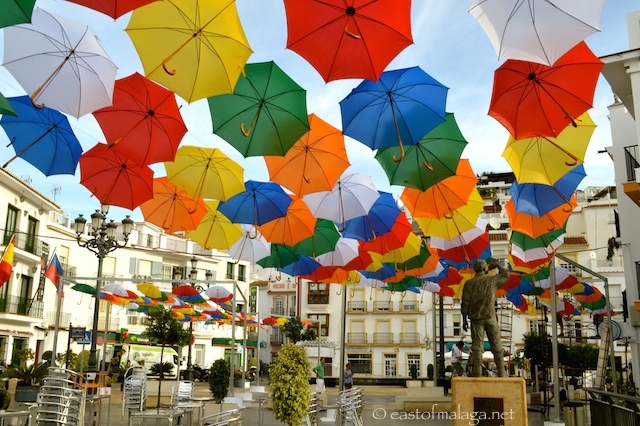 There are hundreds of umbrellas, in six different colours, hanging from discreet wires all around the square. 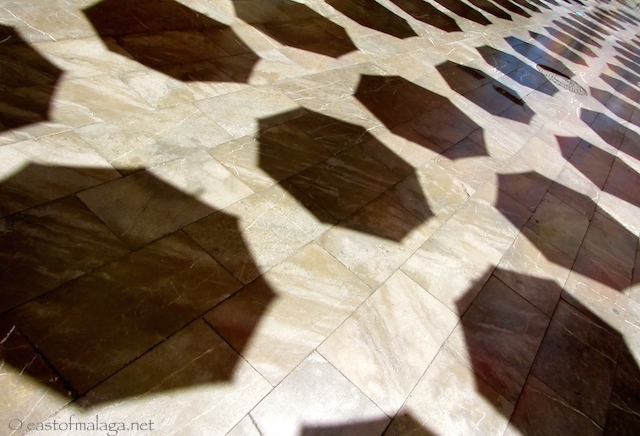 To give much needed shade, as well as making the town (even more) attractive to visitors! How cool/funky/quirky is this, huh? Let me know what YOU think …. This entry was tagged Andalucía, culture, East of Malaga, Europe, fiestas, funky town, life, Malaga, photography, Torrox, travel, white villages. Bookmark the permalink. What a fairy tale! Spain does much to accomodate their tourists:) Once, long time ago we were in a hotel for a week in Malaga! Great memories! I haven’t been to Torrox in the summer. Must be so fun to see those umbrellas. Here in Malaga they always have the toldos on calle Larios. I don’t remember that they ever put up anything to give shade in Canada. Must be too cold and not sunny enough there I guess haha. 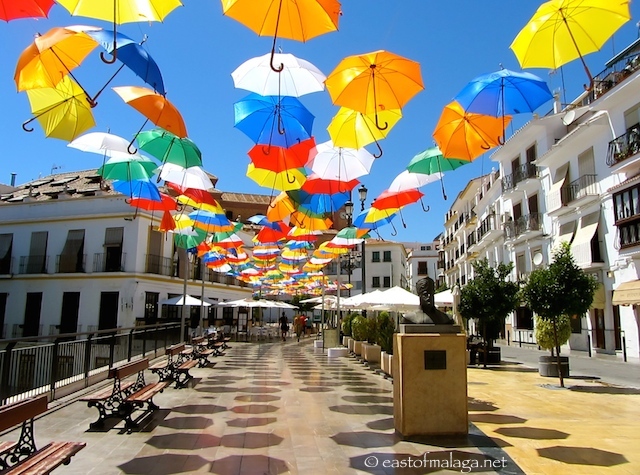 Fabulous picture and colours hope they will still be up when we arrive mid sept. Have never been to pueblo went to costa last sept as it was our first time to nerja so pueblo is on d list this time. 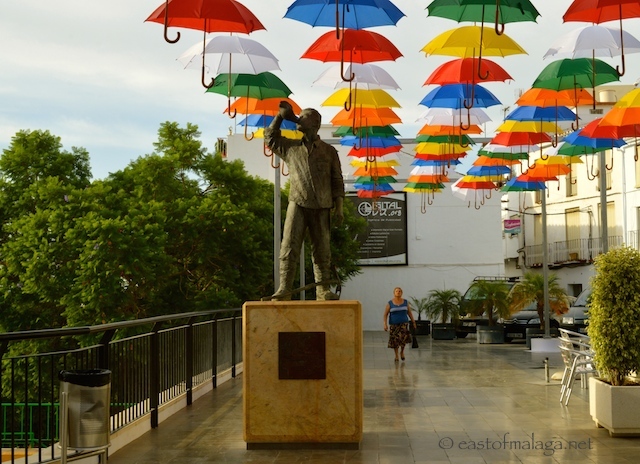 We could do with millions of those umbrellas here in Ireland for all the rain we get☁☁☔☔love your site so interesting. Yes they are, Linda – in fact, since the original 600 or so were put up, they have proved so popular that a further 500 have now been added. Heading for Tavira next week to check whether sunshine still exists. I do exaggerate! It hasn’t been a bad English summer. Best wishes to you, hon. Hahaha – it was worth it then, Gordon 🙂 Thanks for getting in touch! This is weird! Only yesterday I read another fellow blogger’ s entry and it also showed pictures of a street in Jerusalem decorated with umbrellas. Maybe it is the in-thing this summer. Expecting rain, perhaps? Beautiful! I arrived to Torrox yesterday to visit my parents and we went down to the Plaza is truly look great. Bilbao really needs to do something like this. Hahaha … thanks Dianne 🙂 Glad you liked it! Really funky Marianne, I love them and they’ve brought the streets to life! Not usually at this time of year – but, funnily enough, it’s blown quite a bit over the past couple of days. Hope they stay OK! So striking! I love the colors! I hope you are well! 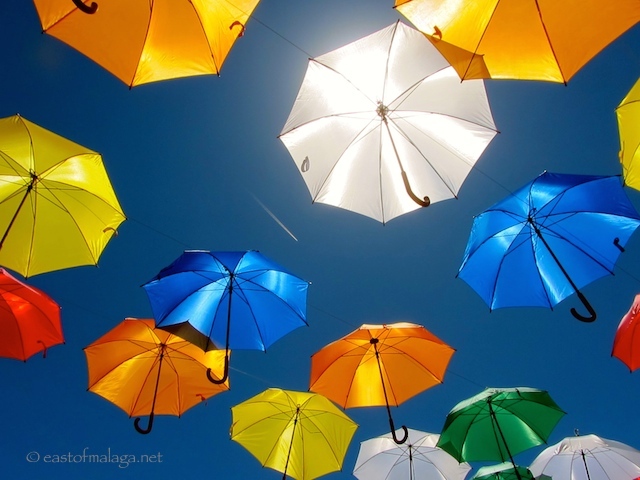 I love this umbrella craze! I’ve seen them in numerous places all over the world, and they really are quite whimsical and charming. Love them! OOHH have you Kathy? These are the first ones I’ve seen, but I can understand they would be popular. I love them! Lovely! I saw a similar thing in Turkey…. What a fantastic way to brighten things up and I imagine the movement in the breeze is quite good too. I’m not sure how protective they’ll be in the rain though if people move around, catching a drip down the back of ther neck is never pleasant. That’s brilliant , what a practical bit of decoration. We had breakfast there in June ( before the brollies) an amazing place to eat or drink and enjoy the buzz. I admire the people who went to the trouble of hanging the umbrellas up there. (We could do with some colourful funk here where I live.) Perhaps it looks so good because of the white buildings as a background! You’re right – it was quite hot yesterday morning (even at 9am) and the platform that the guys were using to hang the umbrellas looked a bit shaky!! Blue skies and white buildings make most photos look inviting though. Great shot of the umbrellas alone. Really well done. Must see this. Thanks 🙂 Yes – well worth a visit! I love it!! Funky and colourful.